Rolls Royce 1934 20/25 six seater Limousine. Every now and again we all need a treat and here you have just that awaiting you. 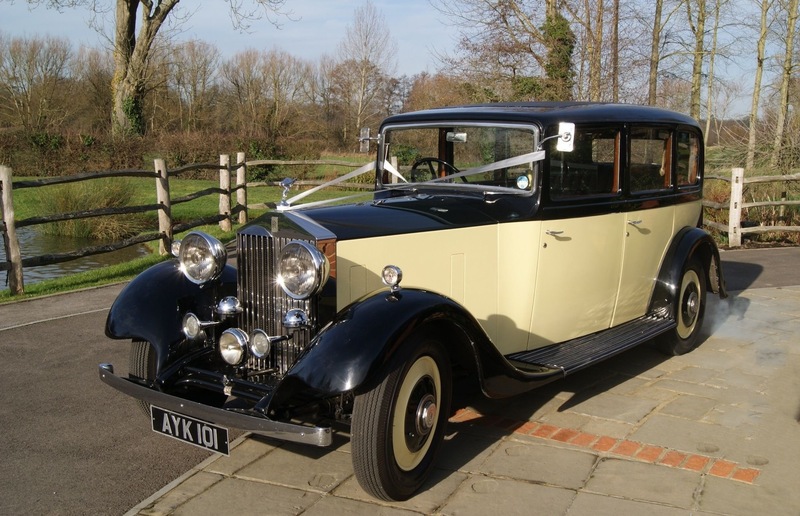 Our Rolls Royce is a 1934 Rolls Royce 20/25 Thrupp & Mabeley Six Seater Limousine finished in ebony with cream side panels. The darker tones are so highly reflective that you can literally take a photograph and see your own reflection in the developed image. This vehicle is steeped in history. The engine purrs and the doors close with the sound of heavy quality. Once within the huge interior, you are taken back to an age where you can only marvel at the quality of past times and the grandeur of the upper classes. The interior of the car easily accommodates even the largest of wedding dresses. The seating capacity is up to six passengers with the use of optional occasional seats. The original light beige interior gives an air of freshness and allows fabulous photographs on your special day. The ornate walnut interior trim of this vehicle adds to its charm. The doors are tall and wide, making these vehicles especially easy to enter and exit no matter what size of wedding dress is planned. Between 1929 and 1936 Rolls Royce built 3827 of these fantastic cars. 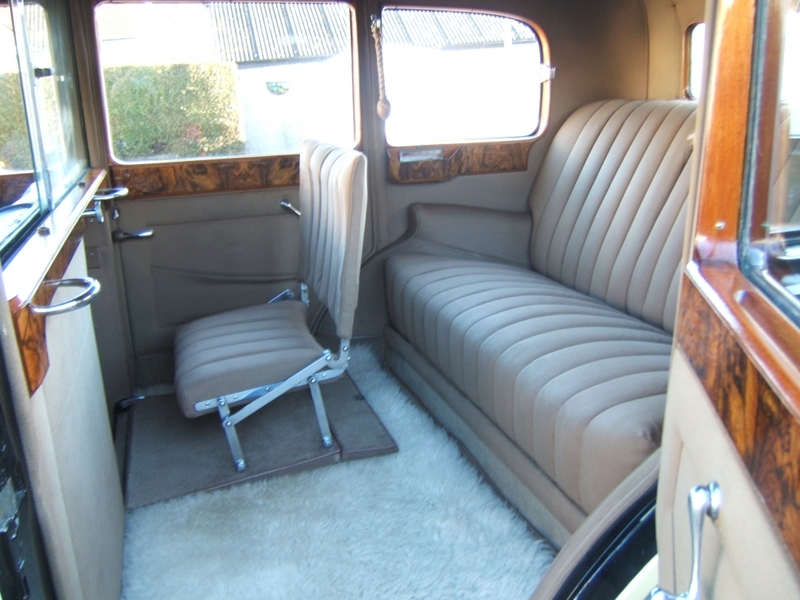 The body was made and fitted by a coachbuilder selected by the owner. Amongst the most famous coachbuilders who produced bodies for Rolls Royce were Park Ward, Thrupp & Maberly, Hooper and Mulliner. 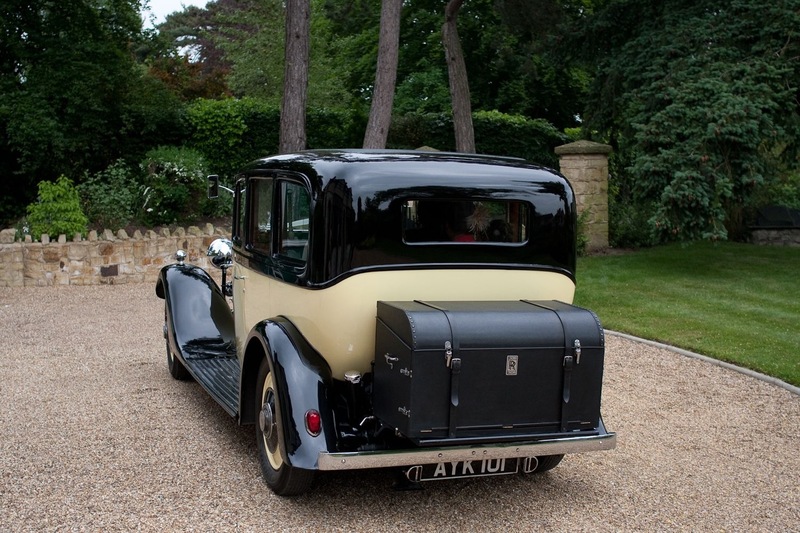 This car was originally ordered by Rootes Ltd to be ready for collection on the 22nd February 1934. At the last moment the car was actually sold to a London fruit and vegetable wholesaler, Mr Alfred Shread from Wanstead. Mr Shread and his family had ownership of this car until the 28th March 1957. In 1957 the car was then purchased by a Capt Vincent Henry Twomey from Crowthorne, Berks. Capt Twomey was a spitfire pilot that was shot down over Yugoslavia on D-Day, June 6th 1944. He was a prisoner of war until being liberated in April 1945. The flying career continued when he joined 610 Meteor Squadron and then moved onto flying Douglas DC60s Britannias. Capt Twomey flew as as an airline pilot eventually flying 707s with British Midland. Capt Twomey's hobby was collecting cars. He had a lifetime attachment to the engineering of Rolls Royce, along with his wife Molly he began collecting luxurious vehicles in the 1950s. This was the first car he purchased as his collection increased through the years. The cars were eventually mothballed and placed in a large barn where they remained until they were put up for auction by Sothebys at RAF Hendon on Dec 7th 1998 by Mrs Twomey. 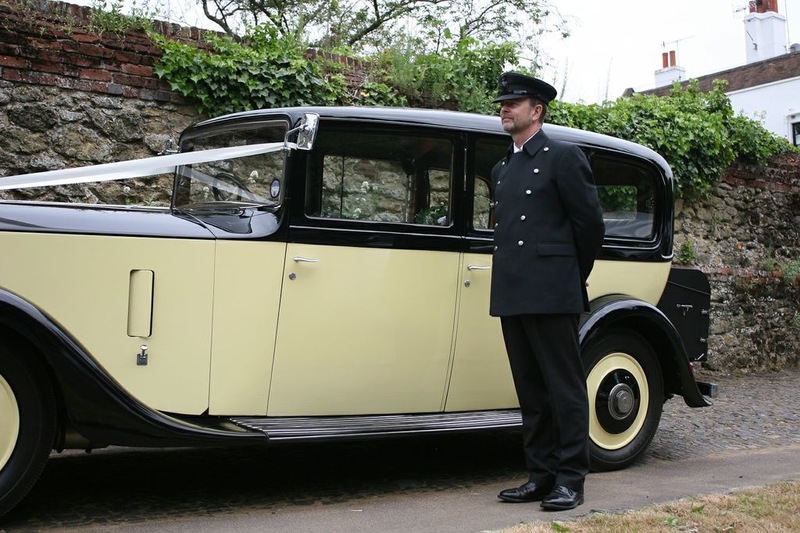 The car was purchased at auction by Mr Clive Edwards from Newport, Wales and was run as part of his wedding car fleet. I retired from the Metropolitan Police in November 2011 after 30 years service and purchased this car from Mr Edwards. The last ten years of my Police service were in the Westminster planning unit and I was lucky enough to be the lead Police wedding planner for the Westminster Abbey wedding of HRH The Duke and Duchess of Cambridge. 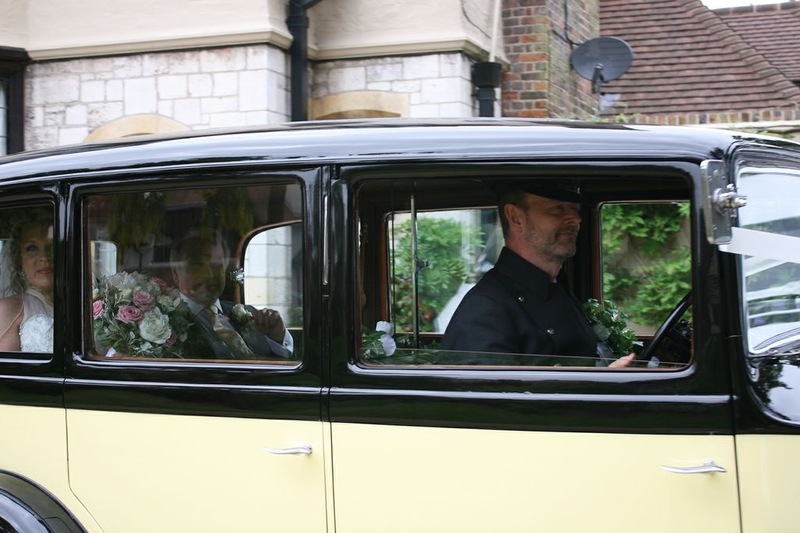 I therefore hope you can trust me to ensure all your wedding transport plans go without a hitch! This car is fitted with 'occassional seats' which can be folded down to provide two extra seats for you if required. Perhaps a bridesmaids run to your wedding venue prior to the movement of the bride. These seats can then be folded back up to provide you with a huge amount of legroom for the main Bridal drive. Ph: 01293 430406. Mob: 07957 114977.